February 2011 it turns out, will be a very social month for us, more so than the holiday season. With an outing tonight and tomorrow, I decided to do a solo long run this morning to avoid a weekend long run. For a moment, I considered doing my 14 miler on the treadmill, discouraged by the overcast sky but thought better of it. Four miles into the run, I took part in an email exchange around a confusion about whether the racing, mentioned a few days ago, was happening today. I suppose having a BlackBerry is a bit of consolation, a kind of companion when you are slogging it out in the winter with no company. There are those days when it takes a lot of positive self-talk to get out there and train so if the promise of being able to check email every few miles makes it a bit easier, so be it. I enjoyed the section in Murakami’s What I Talk About When I Talk About Running where he describes his interview with Toshiko Seko one of Japan’s great marathon runners. Murakami asks Seko if there are days when he doesn’t feel like running. Seko looked at him with a you-must-be-joking expression and answers that of course, there are those days, every day in fact! If one considers the difficulty of his training routine, it makes perfect sense. As we say in the business, the man is a “machine”. In truth, for those who run every day, however humble our goals, we rely on all manner of mental gymnastics to get out the door. Discipline is a lot about becoming highly adept at finding the many reasons, why, why, why when so much of the mind and body says, no, no, no. Anyhow, today was such a day but as usual I reminded myself of how great I feel after a long run and how much I like the results of being highly fit and running fast times. Additionally, I remind myself of how much I dislike the results of less activity. When I started running, I was very motivated by the benefit of stress release and used to visualize that I was leaving stress behind like a trail of soot on the road. My route in a nutshell was west to High Park with a short loop there, then back east through the CNE grounds, past Ontario Place and over to Harbourfront, with a northwest beeline for home. 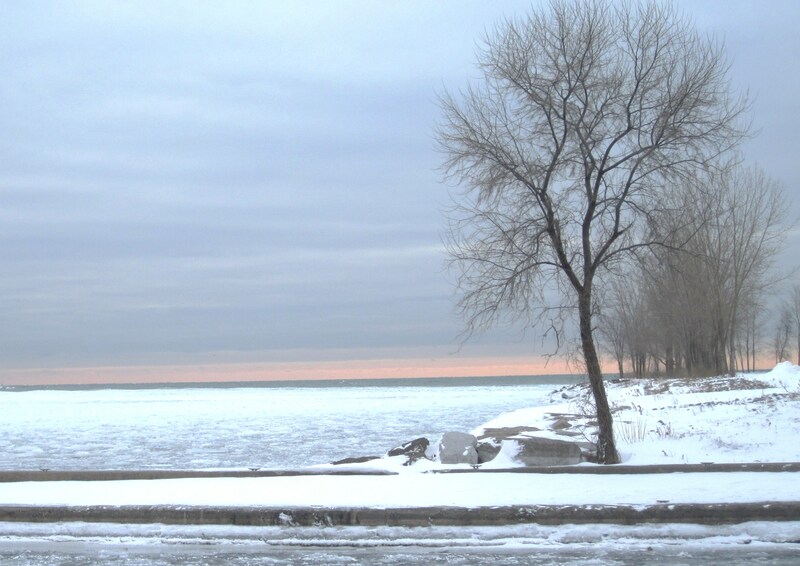 There was a very pretty pink hue hovering on the horizon which made for a pleasant sight while running past Ontario Place. East of there is the Tip Top Tailor building. I’ve run by the Tip Top Tailor building, now converted into lofts for decades, and often wondered about the interior. Today I’ll get the inside story, as that is where we are headed this evening. 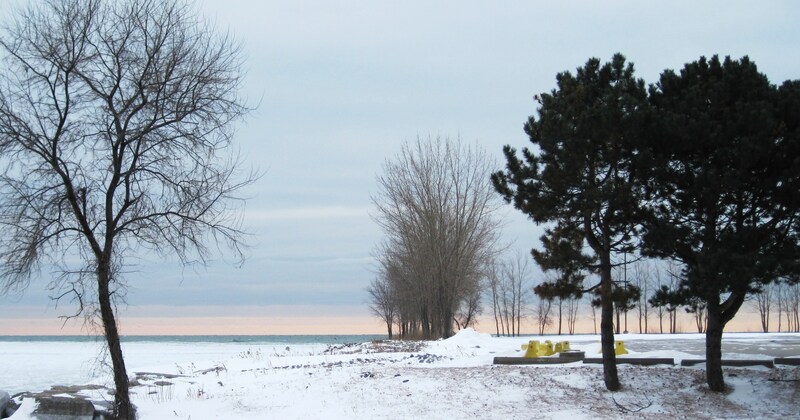 I made a pit stop at Harbourfront Center and took a moment to enjoy a photography exhibit. 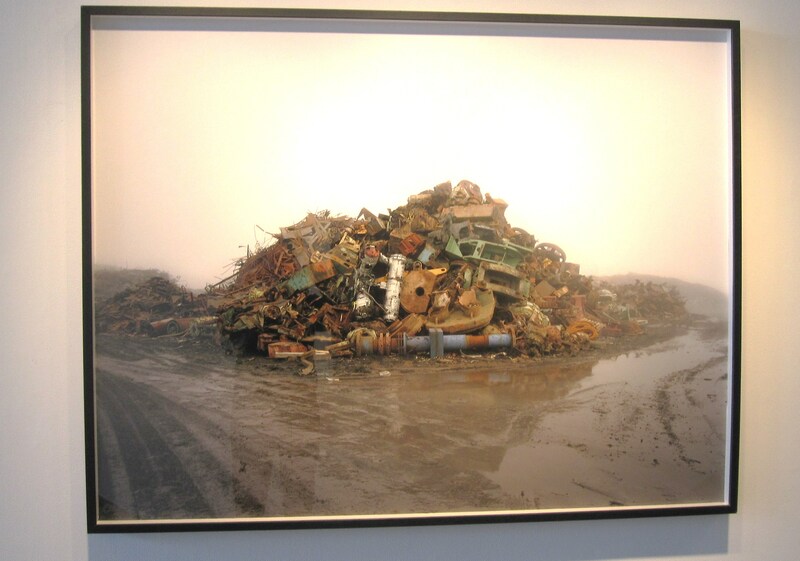 A photo by Jesse Boles which is part of an exhibit called Piles caught my eye. The aesthetic is similar to art that I enjoyed in my younger days. And then I hit the road again, face to face with a very strong west wind. This is the first year that I’ve had a vented face protector and it is a big improvement over the muffler style face warmers which can get iced up in super-cold temperatures. My final stop was the dry cleaners, from there jogging the final stretch home, cleaning in hand. Finishing felt so good that I cheered out loud for myself! As with the camping experience, food tastes better after a long run, so I eagerly dove right into breakfast by making my quickie version of Carrot Cake Oatmeal. If you haven’t tried it yet, you really must. It is super-fine stuff. Recipe: In large microwavable bowl combine 1 cup grated carrots, 1 cup milk, 1/2 cup oats (not quick cooking oats), 1/4 teaspoon vanilla, a dash of cinnamon, raisins (optional), dried cranberries (optional) and cook on high for 5 minutes. Stir. Add chopped pecans, maple syrup and milk or cream. Make sure the bowl you cook the oatmeal in is at least twice the volume of the ingredients as it will boil and bubble vigorously. There was some leftover whipping cream in the fridge so I indulged, and used that instead of milk. 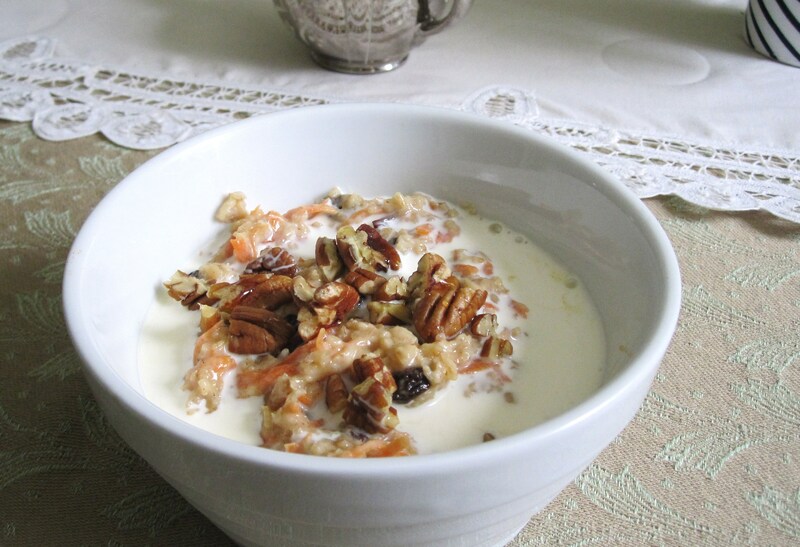 This is my third post about Carrot Cake Oatmeal, and I urge you to give it a try. It’s a real winner and will add excitement to your breakfast table this winter. And how virtuous one feels starting the day with a cup of grated carrot in your cereal, especially after a hardy workout! Categories: Exercise, Fitness, Food, Running, Training, Winter Running | Tags: Exercise, Fitness, Food, health, postaday2011, Running, Training, What I Talk About When I Talk About Running, Winter Running | Permalink. 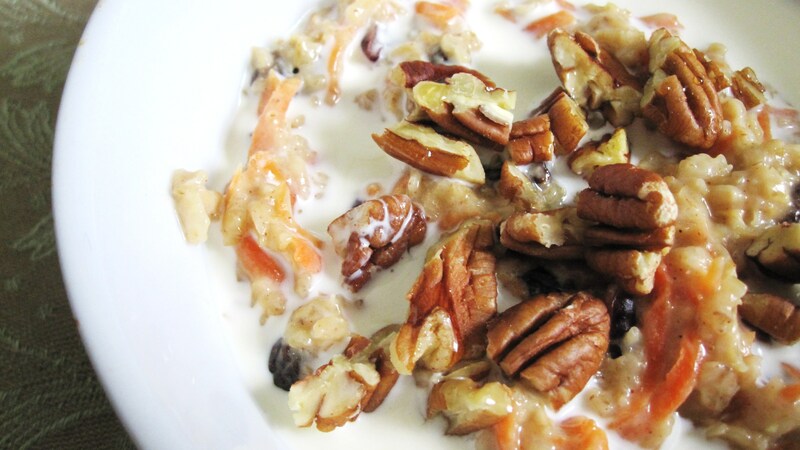 I must try your version of the Carrot Cake Oatmeal!